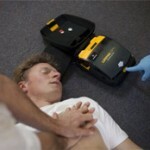 Chesapeake AED Services, LLC started as “Chesapeake Training Services” in September 2003. The owner Mike Marsiglia, a veteran paramedic with 25 years’ experience in Anne Arundel County Fire Department provided CPR Training for companies in the Maryland-DC area. Over time the requests for training made it necessary to hire additional instructors. In 2005 Chesapeake Training Services became an American Heart Association Training center as well as an American Health and Safety Institute-ASHI training center. As a training partner with Medtronic Physio Control and LifeLinkMD the geographical area expanded to include Northern VA, Philadelphia, New Jersey and Delaware. We now have 2 full time and 6 part time instructors. As the company grew, the realization that AED sales were a necessary component of any successful AED program and the decision was made to start retailing AED”s. 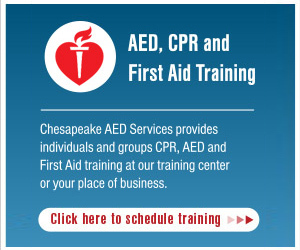 In 2006 Chesapeake Training Services changed its name to reflect the new business model and became Chesapeake AED Services, LLC and was granted a distributorship for Physio Control LifePak family of AED’s. Becoming a CORE partner in 2010 gave Chesapeake AED Services, LLC the opportunity to provide its customers with all of the products necessary for a successful Public Access Defibrillation (PAD) programs. Chesapeake AED Services, LLC provides sales and Services of AED’s as well as training and program management for the entire United States. Per Physio Control, Chesapeake AED’s Services, LLC is the largest distributor in the United States of Physio Control’s Heartsafe Solutions Programs. In May of 2010 Chesapeake AED Services, LLC moved to its current location. The corporate offices provide space for our Executive Team and sales personnel. We also have a state of the art training room capable of training 24 students in a session. This facility now allows us to provide training for individuals as well as our corporate customers. In the fall of 2011 we acquired additional space in preparation for the launch of our Web Store. Customer Service is extremely important to Chesapeake AED Services, LLC and as such there is always someone to answer the phone to answer any questions. As long as I am the owner there will not be a telephone menu. We provide internet pricing with local company service. You can always talk with me, just call and ask for the owner.